Each year, winter brings less than ideal driving conditions to the Adirondacks. Snow, ice, hail, and even rain are all too common, and drivers must learn how to deal with them. To reduce the chances of a winter-related car accident, follow our simple tips for preparing your car. You'll also want to make sure you have a survival kit in your vehicle, just in case! Tires, Wipers, and Mats - Oh My! If you're going to be doing a large amount of driving in winter conditions, you'll want to invest in a set of winter/snow tires. New York State's Department of Motor Vehicles generally allows snow tires with metal studs from mid-October through April 30, but there are some non-studded alternatives as well. Not sure where to start? Many regional drivers purchase a set of tires with a low temperature grip rating and tread patterns that get rid of snow with every revolution. In addition, chances are you'll have to wipe rain, slush, or snow from your windshield while driving, so make sure your wiper blades are in good condition. Buy a sturdy pair that will remove moisture effectively and last you for the entire season. The slush, salt, and sand that collect on the roads in winter can destroy your vehicle's floor mats, so you should have a rubber set with deep trenches to collect anything you track into your car. These washable mats are also great for mud season in the spring. 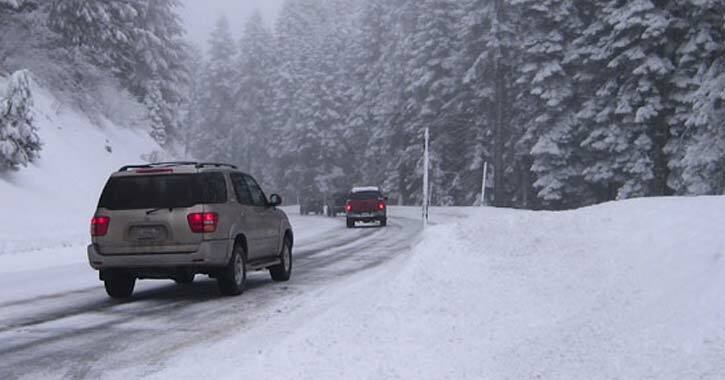 If you get stuck in the snow, sprinkle the road salt or sand near your tires to help you gain traction. You can also shove your floor mats in front of your front tires to help them out as well. Furthermore, you should always have at least a half a tank of gas. Not only is this good for your vehicle in the cold weather, but if you get stuck or lost, you'll be able to keep the car running longer. Also, plan ahead so that you can drive slowly and safely on slippery roads, and never drive faster than you can see. Many dangerous situations can be avoided by taking your time. If a car is tailgating you, pull over and let them pass. Another helpful tip is to leave more distance than you normally would between your vehicle and the one in front of you since it can take longer to come to a stop in poor conditions. You should never slam on the brake when the roads are slippery; lightly tap it until you're fully stopped, or switch to a lower gear. One final essential is extra time. Give yourself at least 10 extra minutes to let your car heat up and defrost before you start driving. Sometimes, you may even have to dig it out of the snow. Follow these simple tips, and you can feel safer about driving through the Adirondack Park during the snowy winter months.